OMEGA Roller Ratchets® were designed as a response for the need of small ratchet wrenches that could be used in tight areas where the swing of the handle was limited by obstructions, and to have a ratchet or tool that would work with very little handle movement. Roller Ratchets® satisfies both of those requirements and is used throughout the aerospace industry. OMEGA Roller Ratchet® functions as a hand ratchet, yet its size greatly increases its versatility by allowing it to be used in tighter areas. These Roller Ratchets® can be used for both removal and installation purposes. The OMEGA RR40S-TS8 Short Handle Reversible Roller Ratchet, #8 Torq-Set is one of thousands of quality tooling products available from MRO Tools. Please browse Roller Ratchets With Replaceable Bits and Bit Holders for tools similar to the OMEGA RR40S-TS8 Short Handle Reversible Roller Ratchet, #8 Torq-Set. OMEGA RR40S-TS8 Short Handle Reversible Roller Ratchet, #8 Torq-Set description summary: OMEGA Roller Ratchet® functions as a hand ratchet, yet its size greatly increases its versatility by allowing it to be used in tighter areas. 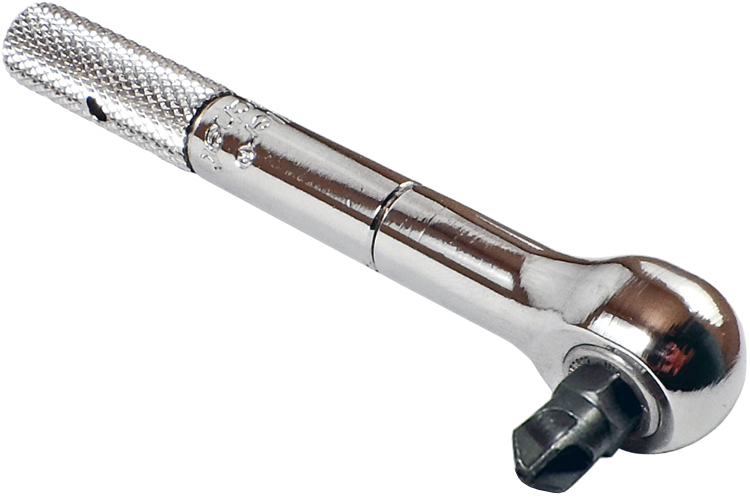 These Roller Ratchets® can be used for both removal and installation purposes. Quantity discounts may be available for the OMEGA RR40S-TS8 Short Handle Reversible Roller Ratchet, #8 Torq-Set. Please contact MRO Tools for details.